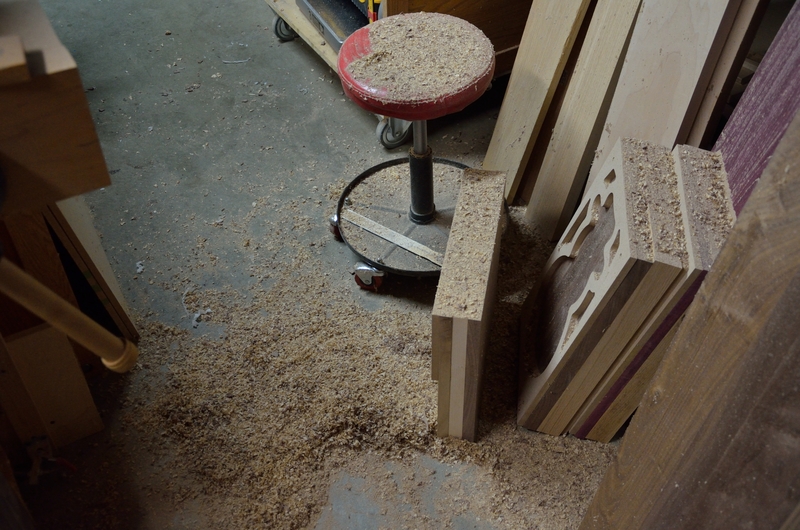 When you’re making sawdust, it’s a good weekend. I have one habit that annoys Velda. OK, settle down out there. That’s a true statement: I do have one habit that annoys Velda. Really, I do. And that’s all I’m admitting to. One habit. Velda annoyed. Sometimes, when I’m backing out of a parking space, I’ll not put my seat belt on until I’m moving forward. Drives her nuts. Now, understand, I never drive any significant distance without a seat belt … its only when I’m backing out, and then when I turn back around to face forward I put the car in drive and put my seat belt on. Drives her nuts. Sure way to hear nagging, every single time. But, IMHO, that’s not a huge safety risk. Apparently she disagrees. Vocally. Predictably. Vociferously. But that’s not today’s story. Today, I was driving at 65 miles an hour in the #2 lane on the 210 … that’s something we Angelenos do, you see (seat belt firmly in place). In the # 1 lane, there was a lady driving a Surburban, going about 75. And she was texting. She looked to be 40 something, so I’m going to say she was old enough to know better. But then, she was old enough to drive so she MUST know better. I thought people understood that driving and texting don’t mix. Honestly, I thought the message had gotten through already. 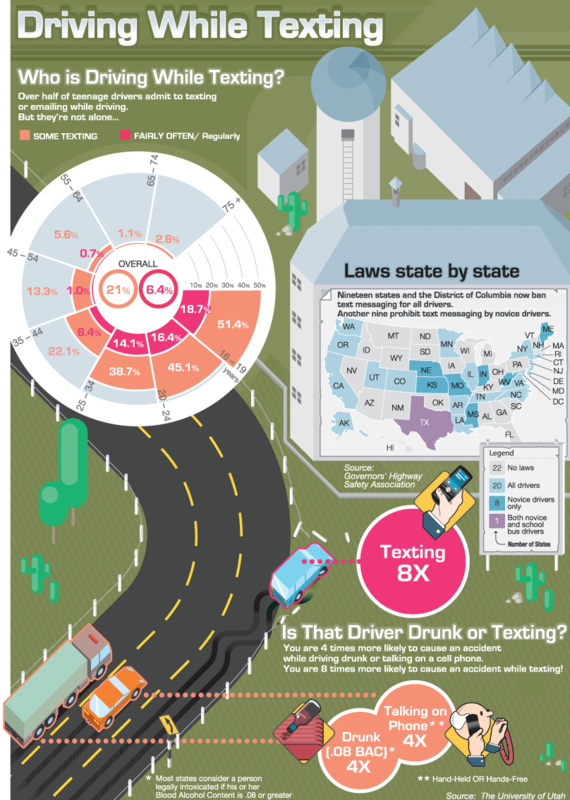 So: Don’t text while driving. I’ll stop backing out without a seatbelt … you stop texting while driving. Where Is It: The only road connects the Park to the small town of Gustavus … so you can’t drive to get to the Park. You must take a plane or boat; the Park is 10 miles west of Juneau, AK. There’s a daily jet service, about 30 minutes, via Alaska Airlines in the summer. Small charters and air taxis are available year-round. The Birth: President Jimmy Carter designated 15 different Alaska areas to be administered by the National Park Service in 1978, and included an expansion of the Glacier Bay National Monument. In 1980m, Carter designated the area the Glacier Bay National Park and Preserve. Hunting is precluded in the National Park, but is allowed in the Preserve. “It’s certainly the largest that we’re aware of” inside the park, Glacier Bay ecologist Lewis Sharman told msnbc.com. Moreover, the force was enormous, Geertsema said. No one was present, but had anyone been there they probably “would be blown over by the air blast,” he told the Associated Press. Officials ruled out an earthquake as the trigger that caused part of the nearly 12,000-foot Lituya Mountain to give way, smothering the ice-white Johns Hopkins Glacier with dark rock and debris over an area a half-mile wide and 5.5 miles long. Size: 3,223,383 acres in the National Park, and 58,406 acres in the Preserve. # Visitors: 454,337 in 2012. The attendance is nominal October – April; July is when the people follow the sun to visit the park. Plants: Glacier Bay is blanketed by a mosaic of plant life, from a few pioneer species in recently exposed areas to intricately balanced climax communities in coastal and alpine regions. Since virtually all the vegetation in the bay has returned to the land in the past 300 years following the retreat of the glaciers, this area is one of the premier sites on the planet to study plant recolonization. Animals: Marine waters make up nearly one fifth of the park and no point of land is more than 30 miles from the coast. This means that the lives of virtually all the animals at Glacier Bay are tied to its productive marine waters or the biologically rich near shore environment. Choices: Most visitors see GBNP on cruise ships. The National Park Service operates cooperative services, placing rangers on ships and boats that offer excursion trips to notable park sites. Fees: There are no entrance fees. Staying There: The park operates one 33-site campground that offers a bear-proof food cache, fire-pits and a warming shelter. It’s a walk-in campground, but there are wheelbarrows you can borrow to take your gear to the campsite. The Glacier Bay Lodge is the only in-park hotel. There are 56 rooms, available Memorial day to Labor day. There are a number of B&B’s outside of the park. Recognized as “ground zero” for global warming, Alaska and its national parks are feeling dramatic effects from our changing climate. 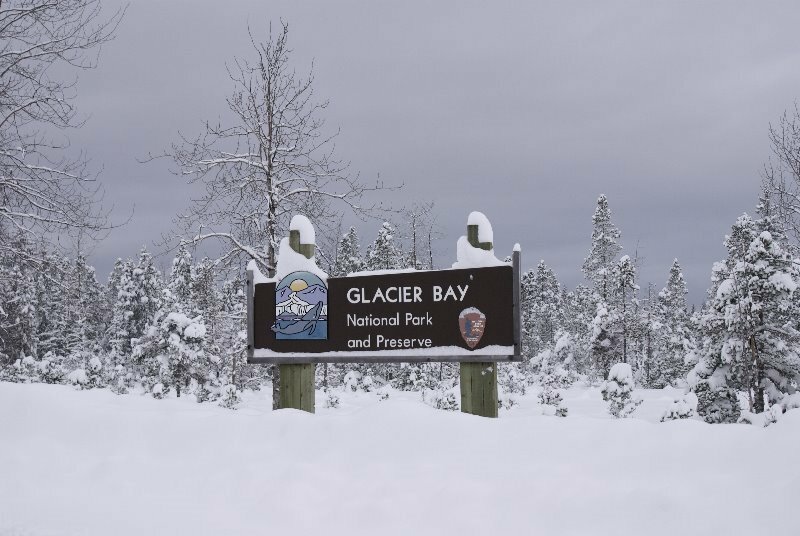 Alaska’s parks provide a living laboratory where this natural phenomenon can be observed (mostly) absent of direct urban & development influences as temperatures rise. Glaciers are rapidly retreating and the reduction of the polar ice pack is having an impact on wildlife and coastal communities from increased storm damage to the shoreline. The arctic tundra’s permafrost is melting, resulting in a loss of wetland ponds vital for waterfowl, and changes in vegetation will cause wildlife to move further north in search of food. No matter how you get to Glacier Bay, you’ll need warm clothing. Visitors often say it feels like they’re standing in front of the freezer with the door open when they’re facing one of the glaciers. A hat or scarf to cover your head and a pair of gloves will go a long way toward keeping you warm, and even if you don’t take a heavy coat, pile on all the layers you can muster. For even more warmth, go to your local sporting goods store and pick up some disposable pocket hand-warmers. Wear sunscreen. You’d be surprised how much of the sun’s burning rays get through, even on a rainy or cloudy day. From the Glacier Bay National Park Facebook page. From the Glacier Bay National Park website. Tweeted by the US Department of the Interior, 11/29/13. Tweeted by the US Department of the Interior, 1/11/14. Tweeted by the US Department of the Interior, 3/16/14. Where Is It: 25 miles southeast of Columbia, SC. 236 miles east of Atlanta. In 1969 relatively high timber prices prompted private landowners to consider resuming logging operations. As a result of an effective “grass roots” campaign launched by the Sierra Club and many local individuals, Congress established Congaree Swamp National Monument in 1976. That designation was not enough to protect the area from the force of Hurricane Hugo in September 1989. The park lost several National Champion trees, but the overall effect was a natural stimulus to growth. Hugo snapped tree tops, thereby allowing sunlight to come through the canopy, promoting new growth beneath. Fallen trees have provided shelter for many species of organisms; standing dead trees became new homes for a variety of plant and animal species, including fungi, insects, reptiles, birds, and bats. On June 30, 1983 Congaree Swamp National Monument was designated an International Biosphere Reserve. In July of 2001 it was designated a Globally Important Bird Area, and on November 10, 2003 it was designated as the nation’s 57th National Park. It Happened Here: Logging tried to happen in the early 20th century, but it proved to be commercially unprofitable due to the swampiness of the land. Heavy equipment couldn’t be used. Only trees close to the waterways could be cut, with the hope of using the waterways to float the logs out of the area. Unfortunately, due to the damp conditions, the green logs would not float. After a few years, operations were abandoned as unproductive, leaving the floodplain basically untouched. Visitors: 109,685 in 2012. May was most attended; December was least. Plants: 75 species of trees are found in Congaree National Park. It is the largest intact tract of old-growth bottomland hardwood forest remaining in the southestern United States. Animals: The Park is entirely forested, but more than 170 bird species have been found in the park. Large animals that have been seen in the park are bobcats, deer, pigs, dogs, coyotes, armadillos and turkeys. The Park waters contain many types of fish, including bowfin, largemouth bass, panfish and catfish. Choices: The Low and High Boardwalk Trails (2.4 miles total) are the best places to start for most visitors. After that, do the Weston Lake Loop Trail (4.4 miles) around the Oxbow Lake. If your are looking for birds, do the 11.7-mile Kingsnake Trail. Fees: Congaree National Park does not charge entrance or tour fees. Staying There: In 2012, the Park banned “car camping” … meaning you can’t sleep in your car. There are a few “walk-in” sites, where you have to walk to a site to pitch your tent. 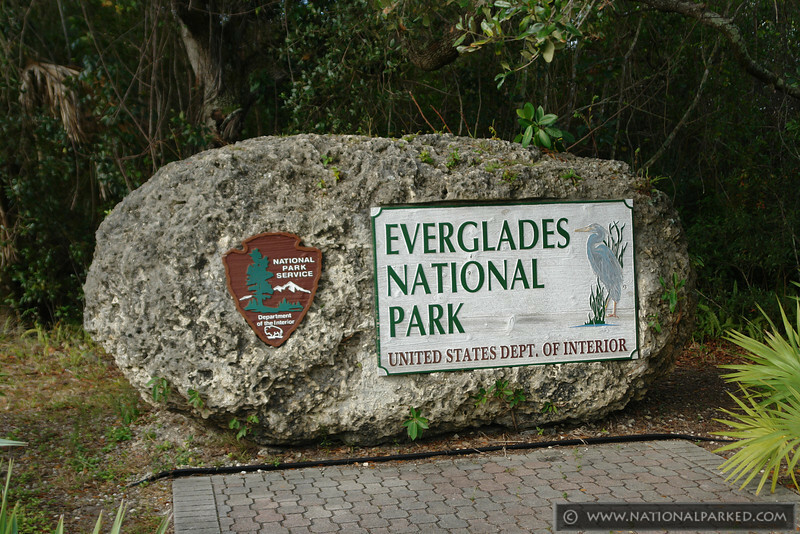 Current Issues: The Park, perhaps still suffering its time as a National Monument when it was known as a Swamp … is considering charging for its services for the first time. The suggested fees are $10 for individual tent sites at the Bluff Campground, $15 for individual tent sites and $25 for group tent sites at the Longleaf Campground, $40 for picnic pavilion rental and $25 for guided canoe trips. Renting a canoe at local outfitters usually costs about $40 a day. Guided tours on Cedar Creek cost around $60 per person. Don’t Miss This: Reservations for the free guided canoe trips on Cedar Creek can now be booked up to several months in advance. Visitors with flexible plans now stand a much better chance of locking in seats for the popular weekend trips. From Congaree National Park’s Facebook page. From the Congaree National Park website. From the Congaree National Park’s Facebook page. Did you know that the winter wren, though weighing less than half an ounce, can deliver its song with ten times more power than a crowing rooster? These loud little birds are common winter residents of Congaree National Park and can be spotted in low brush and fallen trees along the Boardwalk Trail. From the Park’s Facebook page. From the Congaree National Park Facebook page. The State: National Park Considering First Fees…. A brass band with attitude. Love it! Click the link. And I never saw the ending coming. Thanks to g, the top commenter on this blog (! ), for turning me on to the Mnozil Brass. Where Is It: 264 miles northwest of Las Vegas, or 269 miles south of Salt Lake City. J. W. Humphrey had still photographs and movies of the canyon sent to Forest Service officials in Washington D. C. and to officials of the Union Pacific Railroad. Magazine and newspaper articles were written. In 1916, Humphrey secured a $50 appropriation to improve the road and make the rim accessible to automobile traffic. By 1919, tourists from Salt Lake City were visiting Bryce Canyon. Ruby and Minnie Syrett erected tents and supplied meals for over night guests near Sunset Point. In 1920 the Syretts constructed Tourist’s Rest a 30 by 71 foot lodge, with eight or ten nearby cabins and an open air dance floor. In 1923, the Union Pacific Railroad bought the Tourist’s Rest land, buildings and water rights from the Syretts. Ruby and Minnie established Ruby’s Inn just outside the park. Gilbert Stanley Underwood was hired by the Union Pacific to design a lodge near Sunset Point. The original main building was finished by May 1925. 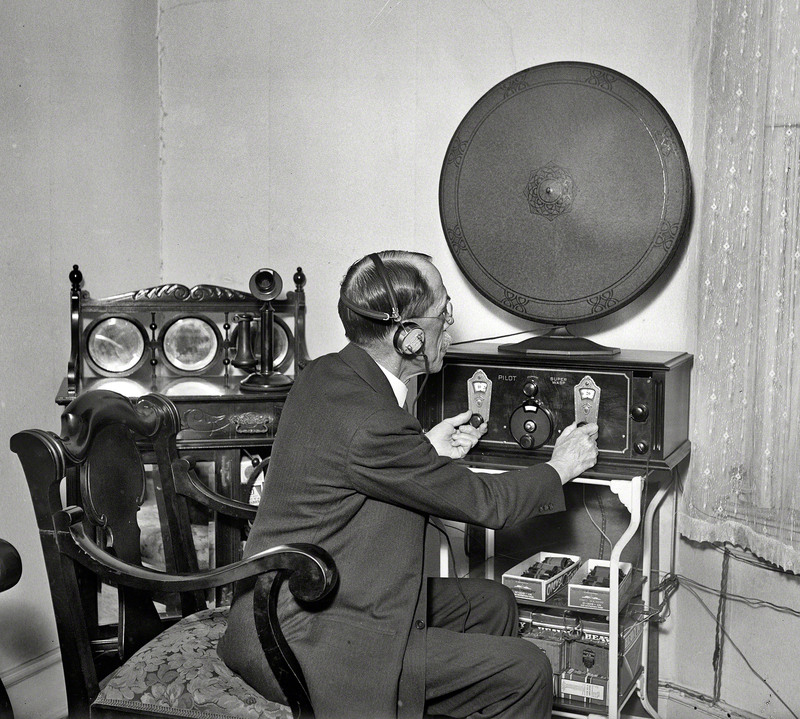 Additions were made and the final configuration completed by 1927. The standard and deluxe cabins near the lodge were constructed between 1925 and 1929. President Warren G. Harding proclaimed Bryce Canyon a national monument on June 8, 1923. On June 7, 1924, Congress passed a bill to establish Utah National Park, when all land within the national monument would become the property of the United States. 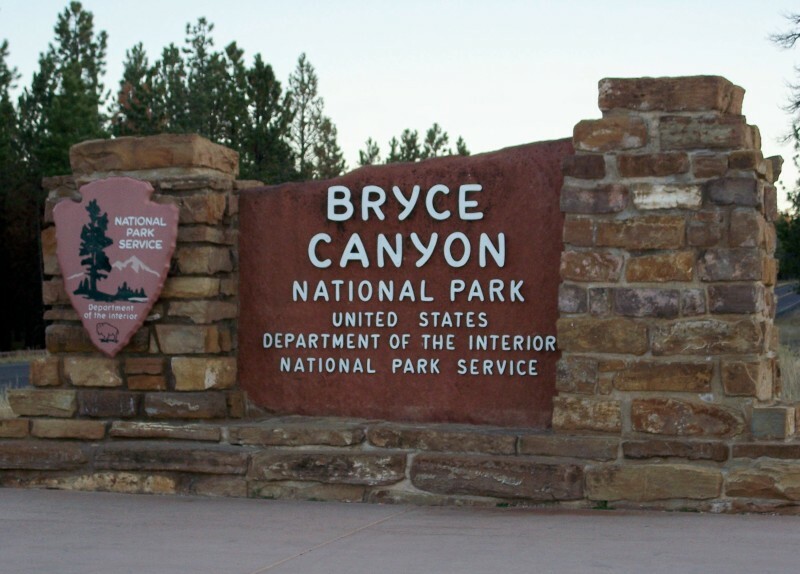 The land was acquired and the name was restored to Bryce Canyon. On February 25, 1928, Bryce Canyon officially became a national park. It Happened Here: 19th century Mormon settler Ebenezer Bryce, for whom the park is named, said it was “a hell of a place to lose a cow.” The canyon’s remarkable collection of whimsical hoodoo spires were believed by the early Paiute Indians to be people frozen in stone by the mischievous spirit Coyote. # Visitors: 1,385,352 in 2012. The largest attendance was in September; the least was in January. It’s the 14th most-attended Park. Plants: There are more than 400 plant species in the Park. The variety in plant communities in Bryce Canyon National Park is due to its diverse topography. While it is surrounded by desert, Bryce’s plateau gets much more rain and stays cooler during the summer. The resulting ecosystem is a fertile island hundreds of feet above a vast arid landscape. Animals: 210 species of birds and 17 species of reptiles and amphibians have been seen in the Park. 73 species of mammals are known to be in the park. Choices: There aren’t a lot of day hiking options in the Park, but you can combine 2 trails to create a 3-mile hike with some rather spectacular geology. Queen’s Garden Trail connects to the Navaho Loop, and they take you into one of the main amphiteaters in the park. You’ll pass Queen’s Garden and Thor’s Hammer. Bryce Canyon National Park is known as a park you see from your car … but when you go hiking, you’ll see a different park. Fees: $25 per car for a 7-day pass. Staying There: The Bryce Canyon Lodge has 114 rooms, including suites, motel rooms and cabins. There are a total of 210 camping sites in two campgrounds in the Park. They are both at 8,000′ in elevation. Maximum RV length is 30′. There are showers. Current Issues: In August, the bicycle race Tour Of Utah crossed the Park on Utah State Road 12. The Park was apparently not consulted, and former Park employees are emphatically against cyclists riding through a National Park … on a State Highway. The sky did not fall during the event, apparently, and the Park was undamaged by cyclists riding through on an asphalt highway. Don’t Miss This: Drive to Rainbow Point (18 miles one way) and stop at the 13 viewpoints on your return trip. Check at the Visitor Center for current road conditions and closures. From the Bryce Canyon National Park Facebook page. July 1997. Our midday visit didn’t have the wonderful lighting you can capture in sunrise and sunset photos. National Park Traveler: Is National Park Service Abrogating Its Responsibility With The Tour Of Utah Bike Race? I’m a fan of college football. I know what it’s like to have an extra ticket. I’m a dad. Love my daughter, known here as Little Girl. 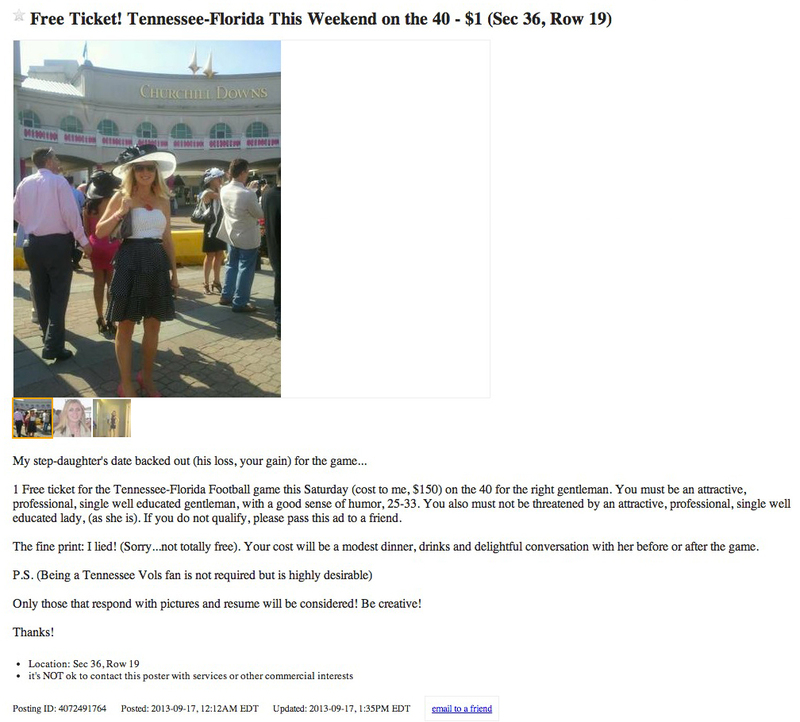 That stated, I’m not going to use football tickets to pimp for my daughter. Like this guy did. Gary Yates is a lifelong Tennessee Volunteers fan, who played the Florida Gators in football on Saturday. 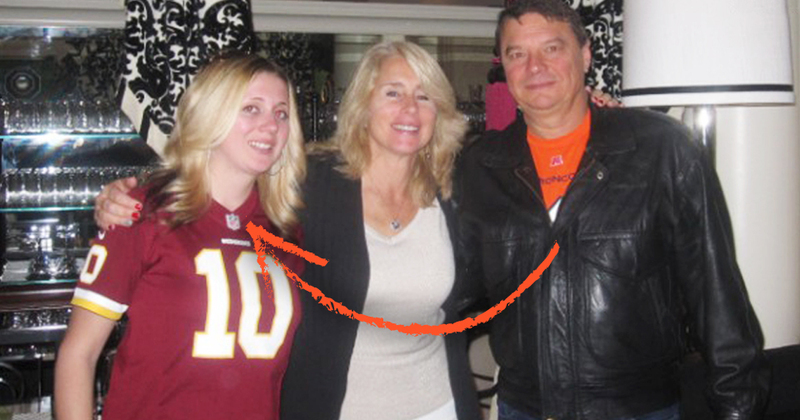 His stepdaughter is named Jessica Flanagan. Gary bought 4 tickets for the game so he could go with Jessica, Jessica’s date and his wife, Jessica’s mother. Gary ran this ad with his daughter’s permission. And her mother’s permission. But he’s still an idiot. Joe Colella is not a Tennessee Volunteers fan. Quite the opposite: he’s a graduate of Florida, who Tennessee is playing. Oh, and he’s also using this as a promotional event. He’s a radio personality in West Palm Beach for the ESPN afflilate. Oh, and he already has a girlfriend. But don’t worry: his girlfriend is cool with him going on this date. Aren’t you glad? 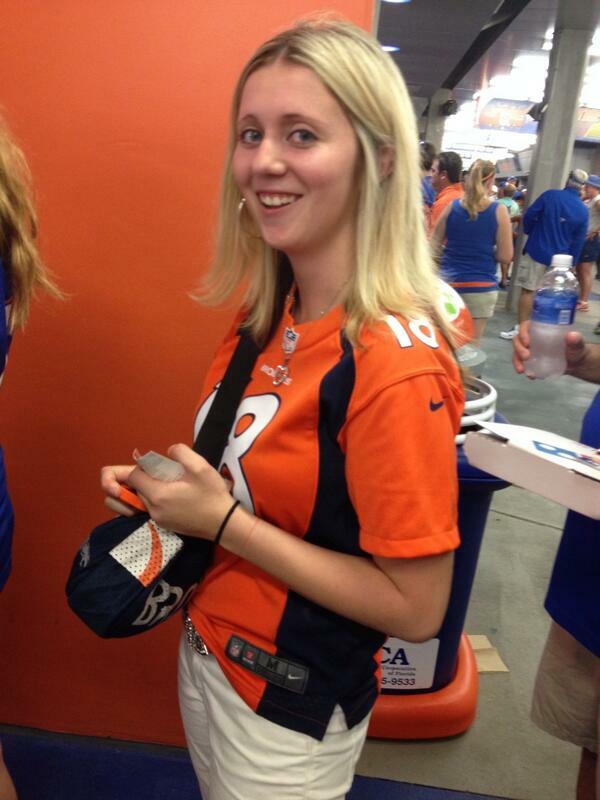 Here’s Jessica, with her game face on. Joe tweeted this photo from the game. It was as ugly as this dating situation. The first half was horrid; the 2nd half was just sad. Tennessee combined with # 19 ranked Florida to have no fewer than 7 turnovers. Tennessee lost, 31-17. 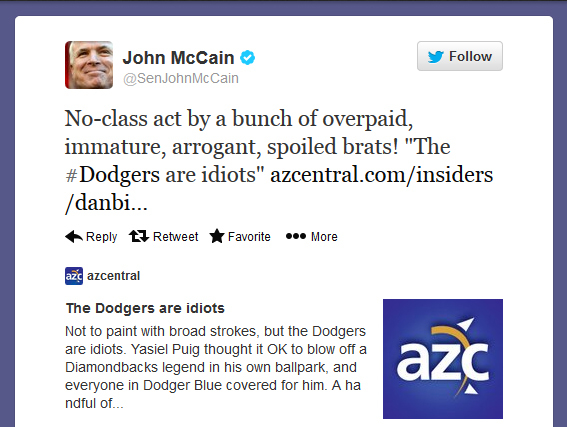 No, John McCain isn’t talking about Democrats. He’s talking about baseball. What happened? The LA Dodgers won the National League’s Western Division championship, clinching after they defeated the Arizona Diamondbacks in Arizona. The Diamondbacks had apparently asked the Dodgers, if they clinched, to leave the field after the game and celebrate in their locker room, not in front of the Diamondbacks fans. Which they did, as you can see. But after the champagne soaked in and the fans were gone, the Dodgers remembered that the Diamondbacks have a swimming pool beyond their outfield fence for fans to take a dip in during games. No clue who thought this was a good idea, but it’s there. 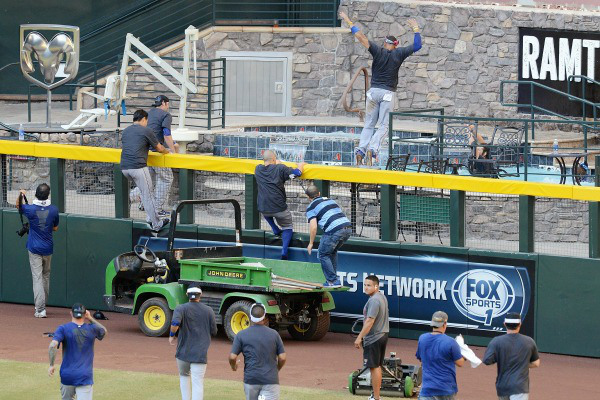 So the Dodgers hopped the outfield fence and partied on. 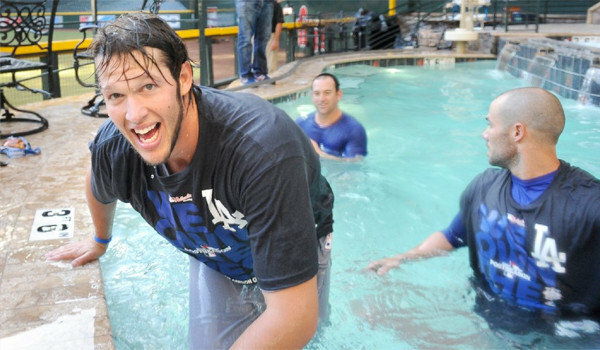 Clayton Kershaw, the best pitcher in baseball, enjoys a dip in the Diamondback pool. And that’s where it got weird. 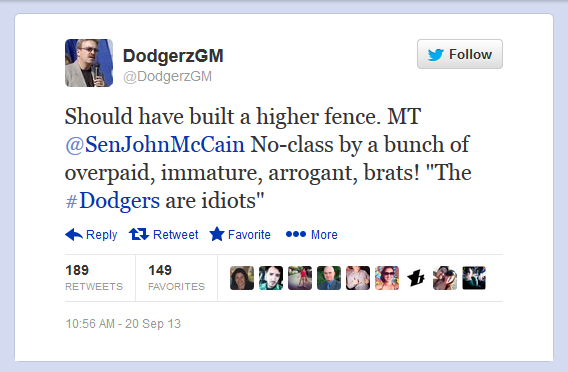 No less of an Arizona representative than the Honorable US Senator John McCain chimed in. 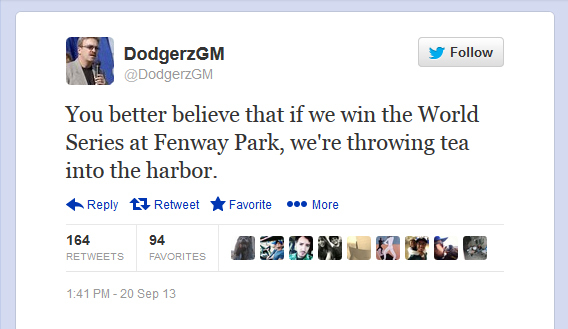 But this is baseball, so snippy responses must follow. 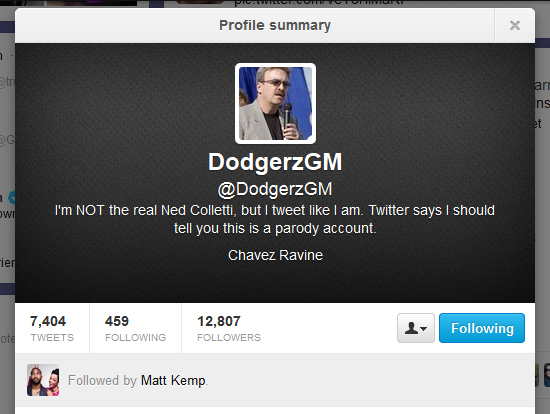 And the ultimate response has to belong to a tweet from an unknown humorist who tweets as if he is the Dodger’s GM … but he’s not. 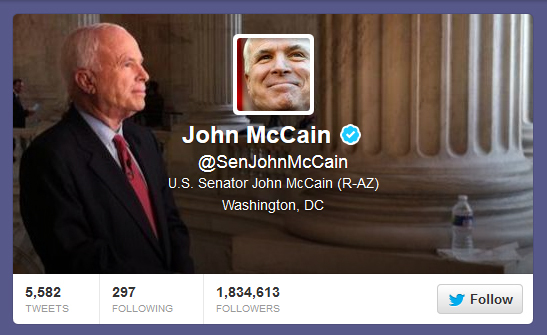 What he is, is capable of responding to Mr. McCain.